​​Mosquito Predators - What Animals Eat Mosquitoes? In the circle of life, no living creature is excluded from the order of the food chain. Even the largest shark has its predators. The same goes for the, almost unnoticeable, flying mosquito. Mosquitoes can ruin any good evening outdoors. When they're not biting, the buzzing sound is enough to make you go crazy. We all know how annoying it can be trying to get some sleep, but all you hear is the buzz of a hungry mosquito. Now you’re laying in the dark waving and clapping your hands trying to kill that pest. Finally, it's down, but through the space of your dark room arises yet another familiar buzz. Signaling that your battle for sleep isn't over. If you can somewhat relate, you might be pleased to hear that mosquitoes, do in fact, have a range of predators. From the earliest days of the tiny larvae to the golden years of a mosquito life, these pests endure daily threats. So what eats mosquitoes? Who are the predators we should thank for keeping the pest under control? Continue reading to find out. Do Mosquitoes Have Natural Predators? Mosquitoes face death on a regular basis. They have natural predators in the air, on the ground, and in the water, meaning their life expectancy never really flourishes. Almost any animal will feed on a mosquito, but there are a specific few that use them as their primary source of nutrition. These include purple martins, mosquitofish (yes, really), bats, and the red-eared slider turtle, to name a few. Ironically, the one insect that's nicknamed the 'mosquito eater', doesn't actually eat mosquitoes. In nature’s cycle, predators keep populations under control. If it weren't for mosquito predators, we could all be in pretty big trouble. As much as we would like to depend entirely on these predators as a natural way of keeping the mosquitoes away, that's not always possible. Plenty of studies have been conducted trying to solve the riddle, however, all of which were done within controlled environments. Still, although these species don't stand a chance to eliminate all the mosquitoes of the world entirely, they do help us keep them at bay. Purple martins are a bird species, a type of swallow, to be more specific. They come from the northwestern US, where they migrate to the south each winter. The purple martin is a very beautiful little bird, but its beauty goes far beyond its feathers. This small swallow is a renowned flying insect predator, eating mainly mosquitoes. Of course, it can't eliminate all mosquitoes, but it can lessen their numbers. Bats are nocturnal mammals, meaning they come out at night when the sun is gone. There are numerous bat species, all varying in color and size, found all around the world. But one thing they all share is their love for flying bugs, including mosquitoes. Mosquitoes are on the top of their list when it comes to potential meal options. Although bats are usually very tiny in their body structure, they have a giant appetite. Some of the smaller species found in the north can eat up to three thousands bugs a night. The Gambusia affinis, otherwise known as the mosquitofish, is a short little fish who thrives in almost any water. It was officially introduced near temperate and tropical destinations, to eat mosquito larvae in order to lessen the pest population. It came to the US in the early 1900s, where it began its journey in Texas and was later brought to Hawaii. The initial thought of introducing the mosquitofish was to eliminate Malaria. It then migrated to further destinations beyond the Pacific. This turtle is one of the most commonly seen turtle species in the US. Many households even keep them as pets. They’re very small and carry those signature green-yellowish stripes along their head and neck. Nonetheless, these turtles thrive in still or slow moving waters or swamps, where the bottoms are muddy and soft. This is probably why they love to feast on smaller insects such as mosquito larvae; the meal is simply there when they need it. Frogs and tadpoles belong to the amphibian species, which also includes salamanders and caecilians. Frogs and tadpoles are not known for being a direct predator of mosquitoes, but they do enjoy them here and there. Being from the same environment as mosquito larvae, they sometimes compete for food. This, in turn, can result in the frog eating the larvae instead. The mosquito larvae predation generally takes place in the northern US. Here, species such as the spadefoot toad, green tree frog, and the giant tree frog are the ones known to feast on the larvae. We all know dragonflies, and often see a few outside in the garden during warmer weather. Their beautiful, colorful bodies shine in the sun as they skip over water. Dragonflies are a well-known enemy to the mosquito kind. Known as mosquito hawks, the name says it all. They thrive mainly on mosquitoes. Being hatched in the same environment as mosquito larvae, dragonflies waste no time munching on these pesky flying pests. Damselflies are cousins of the dragonfly family. Their appearance resembles that of their cousins; it is, therefore, common to confuse the two. However, damselflies have broader wings, pointing upwards as opposed to the side. Their bodies are a bit longer and thicker. However, one thing they do have in common is their coloring. Damselflies also have those beautiful, piercing bright tones, enticing potential meals while keeping predators at bay. Damselflies are not known to eat as many mosquitoes as dragonflies. Nevertheless, during a particular stage in their maturity, the babies consume vast amounts of mosquito larvae. Can we fight mosquitoes with mosquitoes? Yes, we can. Thanks to the Toxorhynchites family. This is a particular type of mosquito species. These are usually quite large in size—both as larvae and as adults. Because of their size, many call them the elephant, or treehole, mosquito. By nature, this specific kind of mosquito exhibits more aggressive behavior than its cousins. It is much more persistent during a blood meal where its bite will likely feel more painful. Fortunately, they are not known to carry diseases, and their larvae frequently eat the other growing grubs nearby. Meaning that less of these potentially dangerous mosquitoes are around. We can find our eight-legged spider friends anywhere in the garden. Although many of us try to get rid of them, this could be a bad idea. Spiders are known to eat almost anything trapped in their sticky net, and mosquitoes are no exception. Mosquitoes are a major annoyance which we all would like to live without. Luckily there are plenty of other species who see this flying pest as a delicious meal. 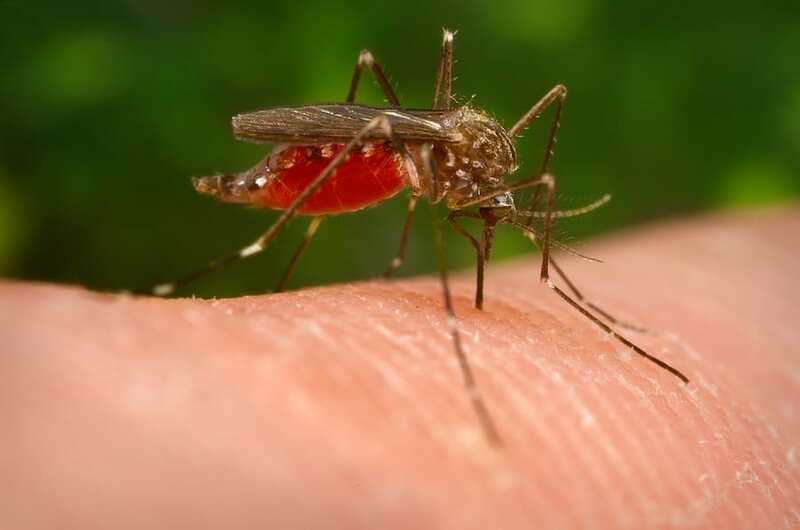 Birds, fish, frogs and turtles, as well as some other insects, all like to feast on the bloodsucking mosquito. Fortunately for us, many of these species are in our habitat. However, they sometimes require a bit of assistance keeping the mosquito counts down. This means that next time you’re thinking about destroying the cobweb in the yard, you should think twice. That might be a home for a potential mosquito predator. There you have it, some useful information about what eats mosquitoes and their natural predators.